Buying a Florida business for sale is not unlike making any other business investment, and just like any other investments, Buyers are seeking a reasonable rate of return on their money. If you have ever watched ABC’s hit television show “Shark Tank” you will find “the sharks” especially Kevin O’Leary, aka Mr. Wonderful, are constantly challenging entrepreneurs about the values they put on their businesses. Mr. O’Leary recognizes that business value needs to be based on historical earnings and any future potential does not translate into value, but only creates a business opportunity worth investing if the price is right. meeting of the minds, between a Buyer and Seller, does not happen when it comes to business value, that putting a deal together will be highly unlikely. For this same reason many of those entrepreneurs on “Shark Tank” will leave the tank with no investment. This exact same thing happens for Florida Businesses for sale, because often Sellers have higher expectations for the business value than what a Buyer may be willing to pay. Most business owners can relate to higher valuations because they know what it took to build and develop their business. They know exactly how much time, energy and money (not to mention the blood, sweat and tears) it took to get that business started. Unfortunately just like those “sharks” on ABC’s “Shark Tank” most Buyers of Florida Businesses for Sale are not prepared to pay a Seller for all that time and energy, not to mention for blood, sweat & tears. Buyers tend to focus strictly on historical earnings and based on current market conditions will buy or invest based on those facts with some consideration as to whether current market conditions would suggest the market will continue or can be grown. Market conditions can have some impact on business value. “The Sharks” on “Shark Tank” often have some experience in a particular market and can usually draw from that, as well as other business experiences, to evaluate the marketability of a given product or service. In the same way Florida Business Brokers can draw conclusions on the marketability of a Florida Business for Sale by looking at the market trends and conditions of that market. The conclusions when examining market conditions are usually straight forward. Flat, declining, saturated or obsolete markets usually make for less desirable opportunities. Business opportunities that have been proven and growing always seem to be the most appealing and thus warrant the higher business values. Opportunities with huge upside potential tend to be riskier as they have often not been proven, although knowledgeable investors may still find the best gems among the undercapitalized opportunities. Whether you are just a fan of ABC’s hit televison show “Shark Tank” or an entrepreneur looking to Buy or Sell a Florida Business for Sale, understanding business value and the differences between the Buyer’s and Seller’s points of view is a key factor to what it takes to put a business deal together. If you are looking to Buy or Sell a business in Florida contact a Florida Business Broker at 239-284-1317. 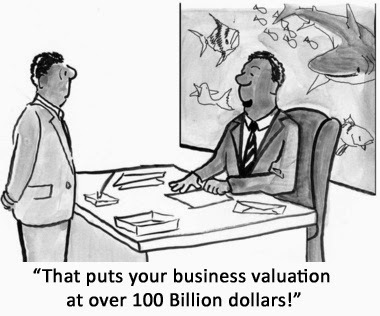 To learn more about Business Valuations check out www.TruforteBusinessGroup.com.